Imagine yourself in the middle of Texas in the summertime, discovering the outdoors with your grandfather. That’s exactly what Callie Tate, the main character in Jacqueline Kelly’s The Evolution of Calpurnia Tate experienced in the summer of 1899 in Caldwell County, right in the middle of Texas. Callie, the 12 year old naturalist, is astonishing because she loves science at such a young age. There is much to like in the storyline, although it starts a little slow. I wish the author starts off fast to grab my attention earlier. Only in chapter four I started to relate to the characters. But the author made up with descriptive words and full of interesting characters. As I continue reading, the Tate family becomes appealing. Everybody in the family takes a nap in the afternoon, while Callie Vee, favors to go swimming in the river flowing next to their house. As Callie likes to observe her surroundings, she takes notes of what she learns in her science notebook. That summer Callie finds her true passion in natural science. In her grandfather, she finds a mentor. As Callie goes deeper into studying nature with her granddaddy, she still has an obligation with her mother to be more ladylike. With sewing, piano lessons, and learning how to cook with her mom she has no time with her grandfather. This causes conflict within Callie and her mother. Of all the characters in the book, I like Callie’s grandfather the most because he becomes a big part in her life during that summer. From the beginning, Callie’s opinion of him was not pleasant. She thinks her grandfather was just an old man who has no interest in his grandchildren. He doesn’t talk to Callie and her five brothers. He is constantly in his laboratory or near the river. Until one day, while Callie is looking through the ground, she sees a gigantic yellow grasshopper that came out of nowhere and asks him how did the grasshopper become so big? Her grandfather answers her question with stories of Darwin’s Theory of Evolution. From that moment on, the two become constant companion in their outdoor adventures. I also enjoy Callie’s character because she is spunky, spirited, and really smart. But she also makes mistakes like a typical teenager. For example, when her brother Harry finds love and almost gets engaged, she gets in the way of his relationship. She says her reason is because she wants to be the only girl in his life since she is his favorite out of the five siblings. 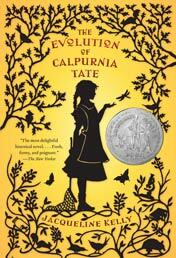 The Evolution of Calpurnia Tate keeps my interest throughout the whole story right up until the end. The society’s expectations for young women like her is to be ladylike, but she wants more. She talks about hating sewing and piano lessons and would prefer to discover more of the outdoors with her grandfather. I admire Callie because she knows what she wants in life and she is determined to achieve it. This book is recommended for anybody who loves adventure, science, and family connection. Kelly has constructed lively characters that will be embedded in my thoughts for a long time.